November 9, 2011: (MAHARISHI VEDIC CITY, IOWA) Leaders of the Global Peace Initiative hosted a Vedic Visitors Weekend, November 4 to 6, at Maharishi Vedic City in southeast Iowa, attracting Indo-Americans from cities as far away as Los Angeles and New York. All the participants assembled for one purpose: to experience a weekend devoted to peace and all things Vedic: Vedic education, Vedic health, Vedic agriculture, and Vedic architecture. The weekend culminated with Grammy-nominated world music artist, Chandrika Tandon, performing a stunning sold-out benefit concert at the Stephen Sondheim Theatre. “The combination of different instruments and Chandrika’s voice revealed to me what World Music should be all about,” said Vinod Nayagar, a university student who attended the concert. “All the sounds emerged from the same source, they resonated and built on each other’s vibrations at the subtlest, most blissful level of creation. The sounds were indistinguishable at transcendental moments—they created a harmony and unity from sound, which is the true purpose of music,” Mr. Nayagar said. Fred Travis, Ph.D., Director of the Center for Brain, Consciousness, and Cognition at Maharishi University of Management in neighboring Fairfield, Iowa, is one of the world’s leading researchers on the brain, consciousness and meditation. His scientific presentation during the weekend on the effects of Transcendental Meditation on brain functioning was highlighted by slides and graphics illustrating the beneficial changes that occur as a result of regular TM practice. From EEG signatures and connectivity maps, Dr. Travis showed how different meditation practices impact different parts of the brain. “Most meditations fall into two categories,” Dr. Travis said. “First are ‘focused attention’ techniques, which require you to concentrate on an object, or a particular word or phrase. The second are ‘open monitoring’ techniques, which involve being mindful of your thoughts or breath without interfering with them. This approach attempts to still the mind and become an uninvolved witness to activity. But these attempts are on the surface level of the mind,” he said. Dr. Travis then identified a third category—“automatic self-transcending”—a process that allows the mind to transcend its own activity. “This is the Transcendental Meditation technique, during which the mind transcends effortlessly, and arrives at the depth of consciousness, the source of the thinking mind, transcendental consciousness, or Samadhi,” Dr. Travis said. Dr. Travis said that after several months of TM practice, the brain begins to demonstrate increased connectivity, even outside of meditation. “The brain functions more holistically, which accounts for the meditating student’s improved academic achievement. The student is able to absorb, integrate, and express knowledge more effectively,” Dr. Travis said. John Hagelin, Ph.D., a Harvard-trained, internationally renowned quantum physicist, provided the modern scientific understanding and corroborating scientific research documenting how groups of experts in the Transcendental Meditation and advanced TM-Sidhi program can neutralize violence and conflict and create world peace. “Extensive research published in peer-reviewed scientific journals verifies that Transcendental Meditation dramatically reduces acute individual stress and its deleterious effects on brain and behavior far more effectively than other methods,” Dr. Hagelin said. 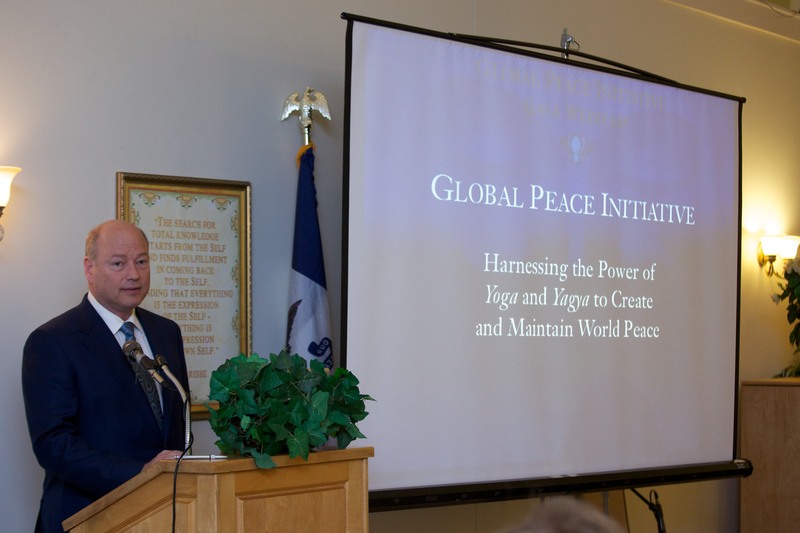 “But perhaps more interesting and important are the 23 published studies which show that relatively small numbers of people practicing the Transcendental Meditation and TM-Sidhi program together in a group can reduce crime, violence, and war throughout the entire population,” he said. 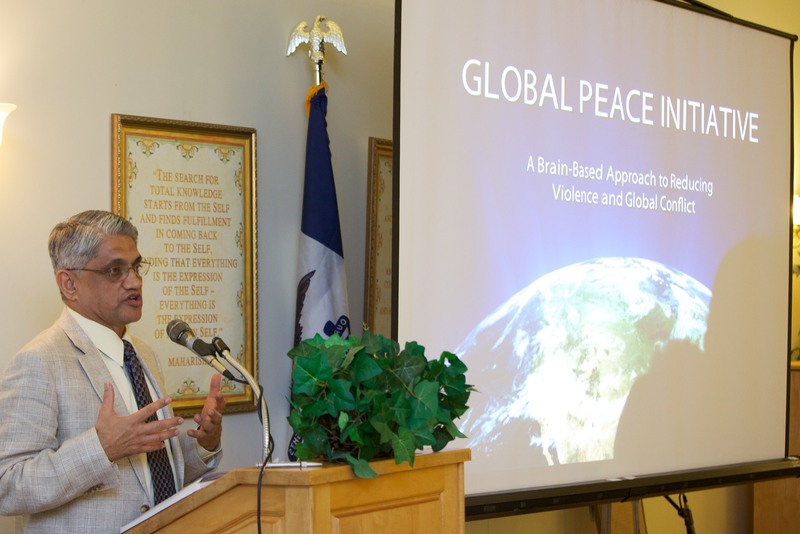 Ramani Ayer provided a vision of the goal of the Global Peace Initiative: To maintain permanent peace-keeping groups of 9000 Vedic Pandits in India and 1250 Vedic Pandits in the United States—the number established by research that is sufficient to create a concrete and demonstrative positive global effect. “The Vedic Pandits’ daily practice of the TM and TM-Sidhi program establishes their consciousness in Yoga, the pure field of intelligence, at the basis of all creation. And their Vedic recitation from that deep and pure level creates a powerful influence of peace for humanity. This perfect combination of Yoga and Yagya will help create a much higher quality of life for the whole world’s population,” Mr. Ayer said. The Global Peace Initiative is building an endowment fund to create and maintain these large groups of Vedic Pandits in perpetuity. Another sublime highlight of the weekend was the performance by 121 Maharishi Vedic Pandits of Rudrabhsihek. G.V. Naidu expressed enthusiasm for the global initiative: “We were pleasantly surprised to see that Maharishi Vedic Vishwa Vidyalaya is training thousands of Vedic Pandits here in America as well as in India. 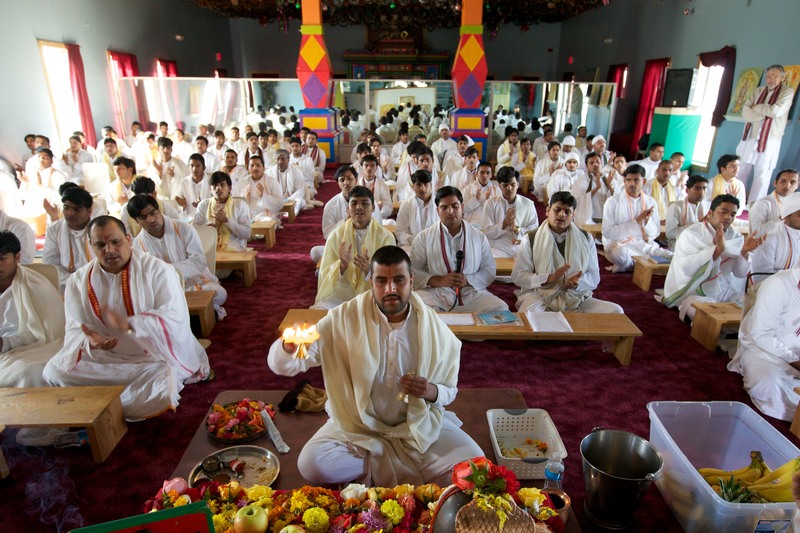 These Vedic Pandits are propagating and sustaining ancient Vedic culture. At the same time, they are conducting fundamental research on the positive effects of meditation—far more than any other organization. I wish more people will participate in future seminars conducted by Maharishi University of Management,” Mr. Naidu said. For more information, visit www.GlobalPeaceInitiative.org and www.VedicPandits.org. 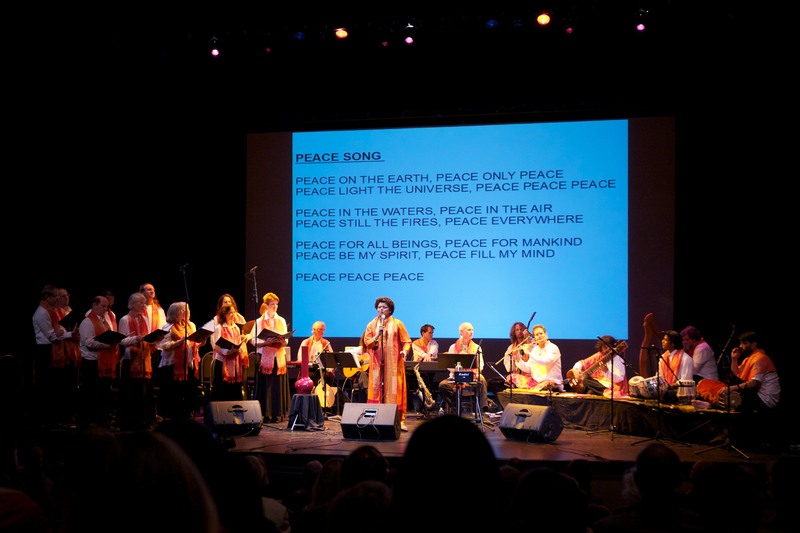 Also see Global Peace Initiative: 13 Questions and Answers with Ramani Ayer, Chandrika Tandon Concert to Benefit 1000 Maharishi Vedic Pandits Launches Global Peace Initiative, and Lavina Melwani interviews Chandrika Tandon on her Grammy Award nomination. This entry was posted on November 9, 2011 at 1:15 pm and is filed under Articles, Education, Health, Music, Peace. You can follow any responses to this entry through the RSS 2.0 feed. You can leave a response, or trackback from your own site.